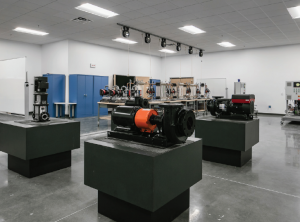 As a global leader in high-tech water pumps and systems, Denmark-based Grundfos employs 1,300 people in the United States and nearly 18,000 globally. The company’s North American headquarters opened in Olathe in 2001. In 2006, Grundfos was looking to expand to Lenexa, and was first introduced to Copaken Brooks by the Lenexa City Manager. After viewing available buildings, Grundfos decided in 2007 to purchase 14 acres at I-435 and 95th Street for a new headquarters. The economic downturn stalled the project, but Copaken Brooks remained in contact with company leadership over the ensuing years. In 2013, Grundfos decided to move its North American leadership to Chicago but still maintain a large presence in the Kansas City area by developing the Lenexa land they had purchased. However, the parcel was larger than necessary, and their current facility wasn’t representative of their culture or the other facilities they owned around the world. Once Grundfos was ready to move forward, Copaken Brooks interviewed and won the rights to develop the new project. The company purchased seven of the original 14 acres and began working on a plan for a customized build-to-suit facility. 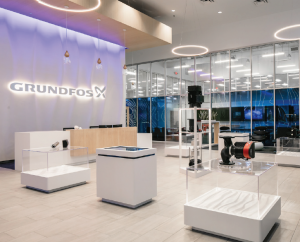 Grundfos hoped to mirror a certain standard and look represented in many of their other buildings and work spaces around the world, and a new build-to-suit office gave them that opportunity, instead of trying to fit in to an existing building or space. Copaken Brooks attended weekly meetings with the general contractor, and the combined team exchanged ideas, modified plans as necessary, and created an open and collaborative process. Copaken Brooks ensured that Grundfos’ needs were aligned with the builder’s schedule and resources. The ribbon-cutting for the new 40,000-square-foot building was held on Oct. 10, 2018. The new facility replaced the Olathe office, and continues to house the company’s customer service, technical training, marketing, business development and other support functions. 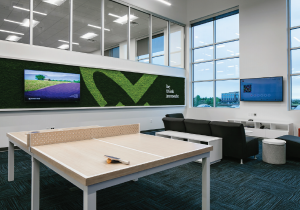 Other employee amenities include a café area, game room, fitness room, experience rooms, lecture hall, training room and a training video production studio. After considering multiple floor plans, the team decided on an open office environment for employees. 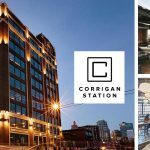 While a Copaken Brooks entity owns the building and leases to Grundfos, the project was truly customized for the company, and Vigil said it already feels like home—and credits Copaken Brooks for their role in the project.